Another one of my samples from Jalam Teas was a lovely packet of Nan Nuo Shan (南糯山) Sheng puer. (Caveat lector: normally Jalam sends their tea in 100g cakes, but as I signed up late I received this sample.) I’ve been excited to try this one because I already have a fondness for teas from the Nan Nuo Shan range. I’ve tasted several teas from this mountain area in the deep south of Yunnan province and, although I don’t believe that there’s any real consistency for tea from a place, I’ve loved every one. There’s something very inviting about the flavors they exhibit. Some kind of “welcome home” sort of energy. And to be honest I haven’t even been that far south in China, so I guess it’s just the tea. One of my first encounters with Nan Nuo Shan tea was in the market streets of Lijiang, an adventure which I’ve written about before. These particular leaves have the aroma of mango: fruity, but not sugar-sweet. It’s intoxicating. Even though the leaves are a little broken, they are definitely consistent in size and rather large (even after shipping in a small packet, which is impressive). Following the instructions on Jalam’s site, I made my first few infusions at 20 seconds and increased the time by about 10 seconds for each subsequent infusion from there. The results were delightful. The taste is something like pine, or like the flavor of eating a raw mushroom: woody with a savory and sweet quality all at once. This held consistently for about fifteen infusions, so I was not disappointed. 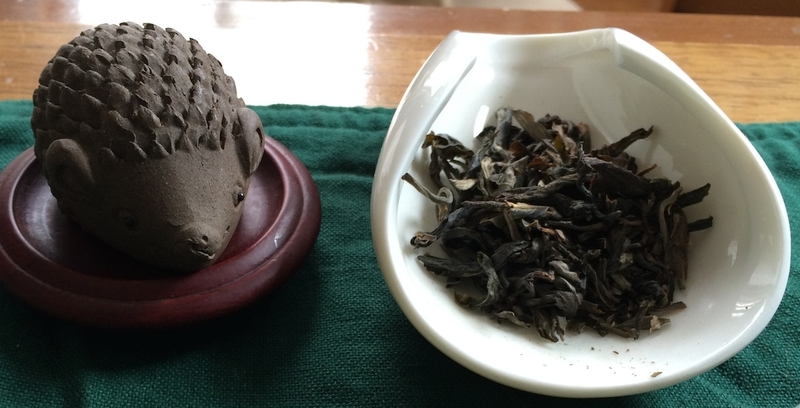 This entry was posted in Tastings and tagged puer on April 4, 2014 by payton.